Custom built to exacting standards with a lineage that traces to the renowned Hans Christian sailing yachts and the Cherubini ketches and schooners, the Cherubini Independence offers a solid and extremely rugged design with the dramatic flair of a North Sea workboat coupled with great craftsmanship and the beauty of a luxury cruiser. This is one handsome vessel! A true Pilothouse design built by a company with generations of boat building experience, each Cherubini Independence was custom built for their original owners so no two are exactly the same. This boat was fitted with extra fuel capacity and has upgraded aluminum framed windows and secure pilothouse doors for example, along with a whirlpool tub and custom cabinetry. 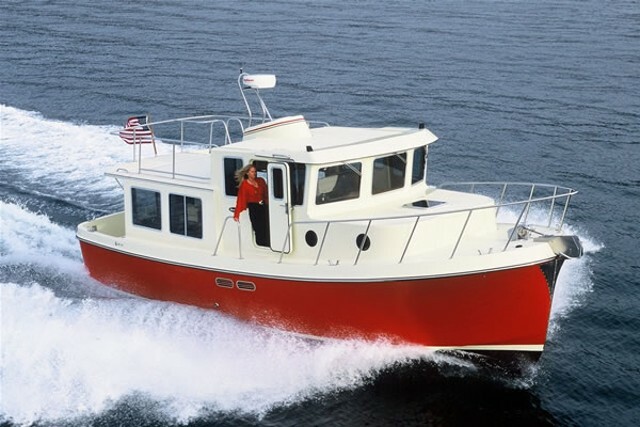 The Pilothouse has the look and feel of a true ocean-going vessel capable of safely handling whatever you encounter! Powered by twin Cummins 6BTA diesels rated at 370 HP each, her equipment list is quite long, 10kW Northern Lights Generator, Wesmar Stabilizers, 24 VDC Bow Thruster, 400 GPD Watermaker, Spare Propellers and Shaft for starters. She has benefitted from knowledgeable owners who have cruised the east coast of the US and the Caribbean in her regularly. She sits ready to take you and your crew on new adventures! Custom built to exacting standards and designed to provide safe and comfortable extended cruising, Touch and Go is a Two Stateroom Two Head Raised Pilothouse design that is well planned and comfortable. The Master Stateroom is forward and features a centerline Island Queen berth and an extensive built-in cabinet with drawer storage to starboard. Portside cabinetry includes shelf space, concealed laptop computer drawer and space for the TV, with a large hanging locker behind. The Master Head has a walk-in shower, Vacu-Flush head, solid-surface countertops and sink with excellent storage with a medicine cabinet, under sink cabinets and a portside storage cabinet. The Guest Stateroom is aft of the Master and to port and features twin single berths with a cabinet between as well as a hanging locker and storage. Opposite the Guest Stateroom to starboard is the Guest Head that includes a whirlpool bathtub and shower combination, solid-surface countertops and shower surround, Vacu-flush head, and ample cabinet storage. There are also additional accommodations in the Raised Pilothouse, a three-wide settee along the aft wall of the Pilothouse facing forward easily converts into a full size sea berth with full lookout capability whether underway or at anchor. The Pilothouse features a fixed lunch table to port as well as a foldable chart table, and is centered around a prominent Stidd 500 Captain's chair. 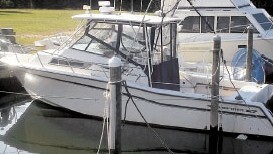 The Raised Pilothouse is prominent center of the boat's design. Well planned and executed, it offers excellent visibility, comfortable and accommodating seating, and is an awesome place from which to see the world! Aft of the Pilothouse and down a few steps the Galley and Salon are on a single level and stretch the full beam of the boat. The U-Shaped Galley is forward of the Salon and is portside, framed beautiful cabinetry with blue Mahogany Granite counters. The Salon features a large and comfortable wrap around U-Shaped Settee to port with centered Salon Table that serves as a comfortable Dinette with seating for four (or more). To starboard in the salon are two seating areas, one facing midships and the portside settee, the other facing forward and the built-in Computer / Entertainment Center. Forward of the Computer / Entertainment Center, opposite of the Galley is a built-in storage cabinet with louvered doors and lots of storage. Here is also located a combination washer-dryer unit. The hull of the Cherubini Independence is solid hand laid fiberglass with Balteck coring used in the topsides beginning six inches above the waterline. The hull and decks are painted with Awlgrip, the hull Ice Blue and the deck white. The aft Cockpit is under fiberglass cover with teak decking and a storage box/seat to port. 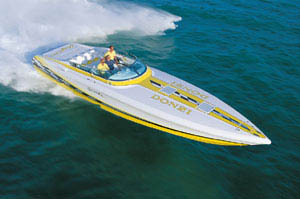 A large transom door opens to a full beam fiberglass swim platform. Access to the main Salon is by a two piece Aluminum framed Dutch-style door. A Lewmar windlass and capstan is to starboard. 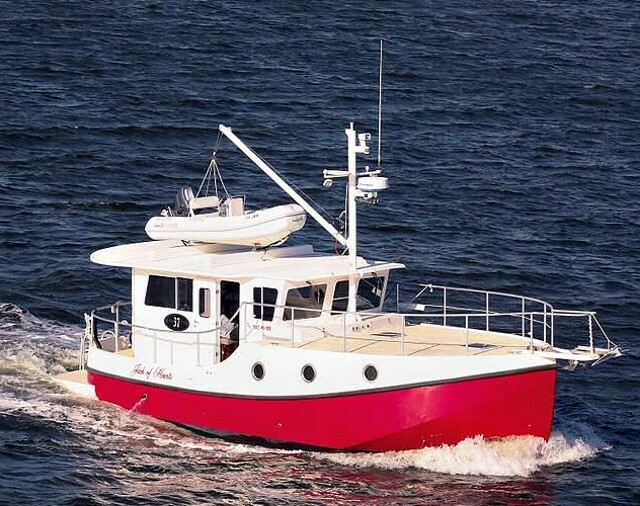 The Bridge Deck is accessible on both sides by means of molded fiberglass steps from the Pilothouse and features a full centerline helm with great visibility, faced by three matching Stidd Helm chairs. Covered by a bimini top with matching helm weather cover, the bridge decking is fiberglass and is framed by 1 1/2" aluminum railing with screens. A Yacht Davit Systems davit is aft of the bridge, supporting access to the tender which sits in a cradle above the cockpit. 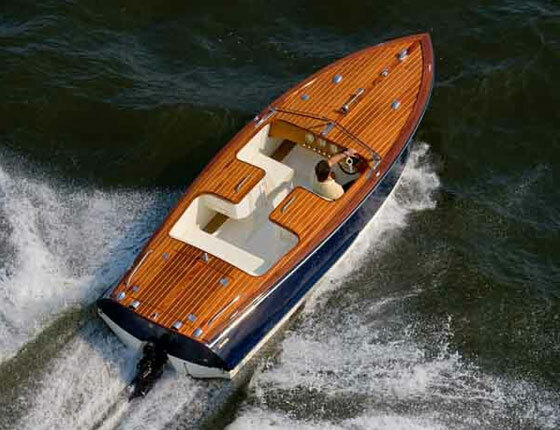 The Foredeck, also accessible from either side of the Pilothouse is framed by teak cap boards and anodized aluminum railing. A fiberglass bowsprit supports a Lighthouse anchor windlass and dual anchor cradles.